Camera body without lens includes batteries, power supply and charger. This full 2/3" DVCPRO HD camcorder records pristine 100Mbps HD images in any of 11 video formats, encompassing 60Hz and 50Hz production. The versatile, cost-effective camera provides higher-quality 4:2:2 intra-frame recording that holds up through layers of special effects, graphic overlays and constant editing and processing. 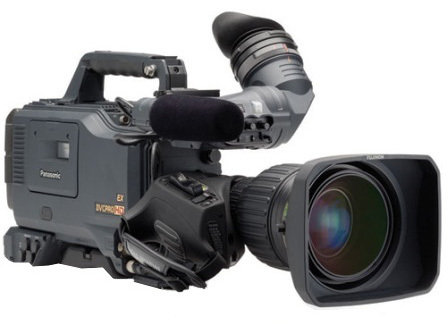 The Panasonic AJ-HDX900 DVCPRO HD Camcorder is rapidly becoming one of the most popular cameras in our inventory. See our DVCPRO Tape Chart for tape options and recording times. Collaboration and content exchange are essential in sports production, cable shows and reality TV -- and nothing maintains the original image integrity and sound quality like DVCPRO HD. With 1080i, 720p, 24p and 25p capabilities, the AJ-HDX900 is perfect for long-form HD programming and an invaluable tool for digital cinematography, cable and television production in any format, sports and events, for globetrotting documentarians and feature crews, and for the rental companies that serve them. The AJ-RC10G comes with a 10 meter (32 feet) 10-pin multi-cable that can connect to the AJ-HDX900's down-conversion video OUT terminal for monitoring at the RCU. The AJ-RC10G provides detailed control of gamma, flare and the AJ-HDX900's versatile paint functions. The AJ-RC10G has a slot for SD memory card; you can save scene settings on a memory card for easy transfer to other cameras. Longer cables up to 90meters (295 feet) are available. The Chrosziel 203-01 is a follow focus designed for film and video cameras. The unique system allows easy operation from both sides, making it highly accessible in a variety of situations. The follow focus makes critical focus pulling a breeze. Markings on the focus wheel give about 110-140 of rotation on the lens, spreading the angle to the focus knob by a factor of two. Precision focus pulling cannot only be achieved with remarkable accuracy; it can also be recreated over and over with very little deviation from take to take. The kit comes with all necessary parts, including a removable hand wheel, focus level, and wheel scale.